Blue Lily, Lily Blue, the long-awaited third book in Maggie Stiefvater’s Raven Cycle series, is published tomorrow. To mark the occasion, I invited some blogging friends — Aarti, Jenny, Memory and Teresa — to join me at Lady Business to discuss the series and speculate wildly about all the ways in which the third book is going to break our hearts. Because the one thing that makes bookish excitement even better is sharing it, I’d love nothing better than for other fellow Raven Cycle fans to join us in comments with their own hopes and dreams and fears for the rest of the series. 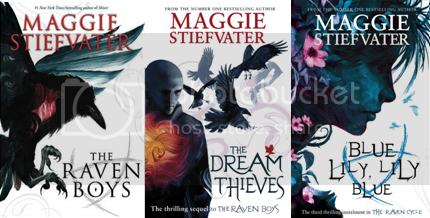 As you can probably guess, our post is full of spoilers for The Raven Boys and The Dream Thieves, but it was written before any of us got our hands on Blue Lily, Lily Blue, so rest assured that there are no spoilers for that. Has anyone read Blue Lily, Lily Blue yet? I’ve been gnashing my teeth over my delayed pre-order and fighting the temptation to just look for it in bookshops on my lunch break in case any have it out early. So. I'm guessing I NEED to read this. I had Raven Boys on my stack sometime ago, but I never did get around to it. Sadly, I'm going to have to refrain from reading you all's post at Lady Business since I haven't read these yet. But I've got a quick question for you--do I start with these or should I read The Scorpio Races first? I haven't read them either! I really need to get to them soon. I read it and loved it, but of course it is not a standalone. But everyone *evolves* and I love that. I aim to re-read the first two and read the third in a massive immersion as soon as I am able. I can't wait!! !